Her artistic musical journey began at 9 years old at the Musikè Academy (in Vibo Valentia), followed by the M. A. De Rito and the M. Francesco Locane. She continues her study at Vibo Valentia’s Conservatory with the M Marco Rossetti and the M. Simonetta Camilletti, until the meeting with M. Giuliano Macrì, who guided her towards the graduation at “P.I. Tchaikovsky” Conservatory and with whom she started the study on teaching, becoming Assistant. She got the Master of Music Degree in Music Disciplines in 2013 with a thesis in Teaching Methodology entitled: “Emilio Pujol e Abel Carlevaro: un confronto didattico”. She attended the Masterclasses and the educational Seminars by Angelo Gilardino, Giulio Tampalini, Vito Nicola Paradiso, David Murgadas, Antonio De Rose, Eduardo Isaac and Vincenza Sciotto. She improved both as a Soloist and in Chamber Music with the M.M.s Giovanni Puddu and Giampaolo Bandini, with whom he obtained a two-year Master of chamber music. Today, her studies concern themes related to Teaching Methodology, Didactics and Propedeutic. She has taught Guitar at “P.I. Tchaikovsky” Conservatoire in Nocera Terinese since 2011. Her activity as a teacher is intense and she gave many concerts as well, both as a soloist and in chamber music groups, in fact, she took part in important international campus and festivals: Naxos Winter Campus, Campus AFAM ,Festival Atto Unico of Noto, Festival Giorgio Gaber, Umbria Classica, TaoArte, Festival Orchestre a Plettro, Lamezia Classica, besides standing out in National and International competitions, both in Italy and Spain, for her music talent. Many paths engaged her in a constant research on instrumental teaching, also made through the study of Neuroscience (she earned, in fact, the Licensed Practitioner certification in NLP in the field of education, joining the Richard Bandler’s NLP Society of USA), learning from the Trainers Stefano Santori and Giacomo Bruno, and proprioceptive knowledge, applied to the relationship with the musical instrument, to posture (she studied with the Personal Trainers Giuseppe Torre and Gerardo Martino integrating Mezières, Feldenkrais, Anderson, Alexander, Pnf and similar methods) and to the executive performance, leading her, to practise the profession of Music & Life Coach (from 2013 onwards the references of her services can be found on Canale Formazione.com too). She obtained the Master in Show Business Law with Altalex Counseling in 2014. Currently she attends the Modern Languages Department at the University of Calabria. She is the Vice-President and the Artistic Director of the “J.K. 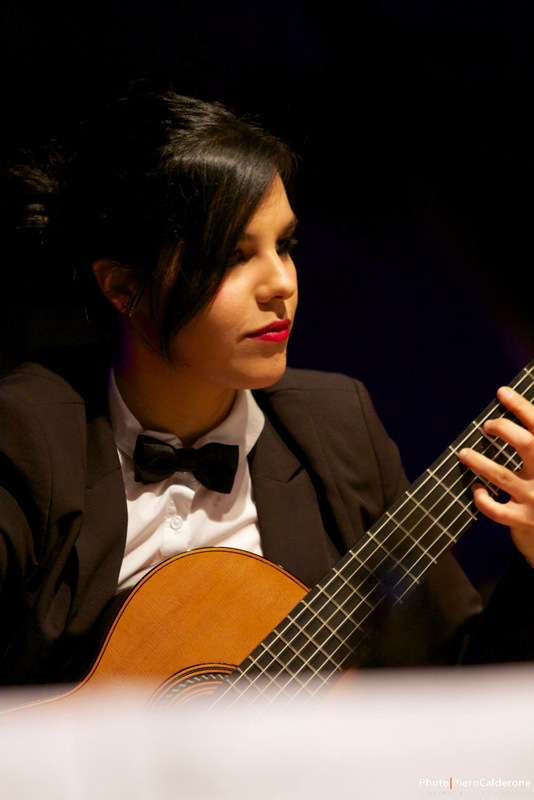 Mertz” Guitar Academy, based in Barcellona P.g., that she founded, together with Carmelo Imbesi, in 2013. She is the Artistic Director of the Section devoted to Classical Music in ESPRESSIVAMENTE, Festival organised by Parco Museo Jalari, and promoter of cultural Events. She plays guitars made by the Argentine luthier Walter C. Rosso.